A perfectly acceptable slice of Motown, Stax and Northern Soul-ish material from bluesy old veteran Southside Johnny. All the usual ingredients are here - blasting horns, backing vocals and Southside's trademark gravelly voice. 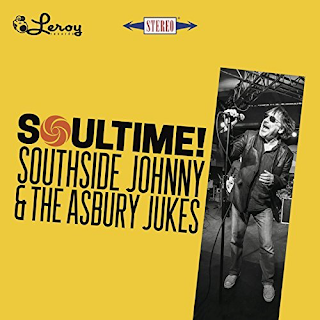 The track "Looking For A Good Time" pretty much sums it up - Motown influenced rocker that finishes off the first four tracks of typical Southside stuff - "Spinning", "All I Can Do" and the punchy "Don't Waste My Time". Until then there has no let up in the pace or no real change in the style of the songs. "Words Fail Me" sees ol' South getting all romantic as the tempo drops. Quite a beautiful song, delivered well with a lovely horn, organ, bass and piano solo bit in the middle. Lovely. Even though this album isn't really up there with is classic late 70s material he never lets you down. "Walking On A Thin Line" is a menacing slow cooker, bluesy horns and a bit of wah-wah guitar in there and a great vocal from the man. Very atmospheric. "Klank" is a funky instrumental. "Ain't Nobody's Bizness" has a great bass line and wouldn't have sounded out of place on his 1976 debut album "I Don't Want To Go Home". I have realised, listening to this album for a few more times than I had initially, that it kicks rear quarters, so to speak. Also, the sound quality is better than on most Southside albums. Warmer and more bassy. Good. 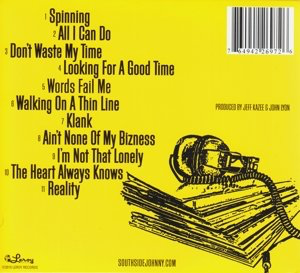 Then we get "I'm Not That Lonely", the album's only true Southside anthem with a great chorus and his voice rising above those wonderful horns. Sometimes he truly is a gin-soaked heavenly messenger. Just listen to those horns on the fade out. "The Heart Always Knows" is a soulful heartbreaker. A few Buddy Holly-style strings on there. Beautiful. "Reality" is a tense, funky closer.